This page allows you to import users from an LDAP server. This allows you to automatically import the list of users, and groups from standalone LDAP servers or other mailservers that support LDAP, and automatically synchronize the lists. Just re-import to synchronize the list, or use the scheduling to have it done automatically. Specify the hostname of your LDAP server here. In some cases simply the machine/computer name will do in others you need to specify ComputerName.yourdomain.com. This login is typically the one you use to logon to the LDAP server as administrator. 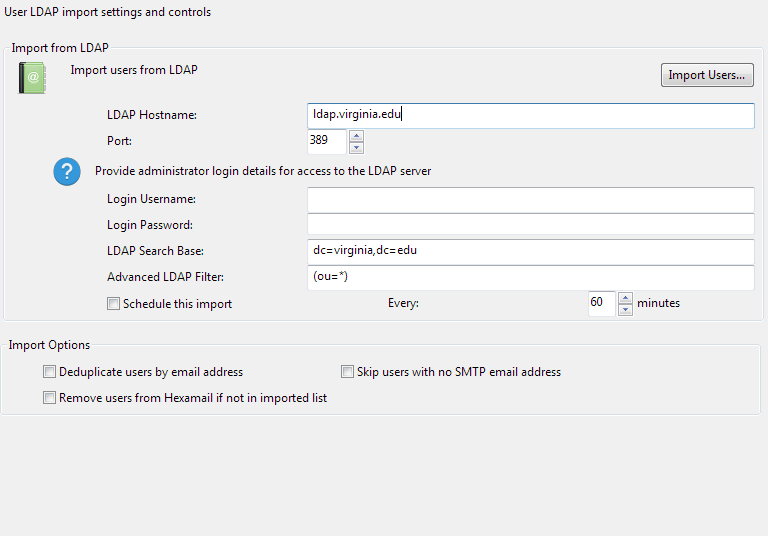 If you are connecting to an Active Directory computer using LDAP use the format DOMAIN\user or user@domain.com for this field. This login is typically the one you use to logon to the LDAP server as administrator. This password is sent and stored using strong encryption by the service. In some cases you may wish to restrict the search query to specific parts of the LDAP server. Use this setting to specify the base DN. For example to just search your domain use the setting "DC=domain,DC=com"
Use this setting to enable automatic scheduled synchronization of the users from the configured LDAP server. $productname$ can automatically deduplicate your users list by email address - this includes all email address alias for each user, and ensures that only one user in $productname$ is associated with each email address. Depending on your search filter and other factors you may sometimes find users with no associated email address in $productname$ - use this setting to ensure these users are not imported. When users are removed or disabled in Active Directory, or no longer present in an imported csv file, you can have them removed automatically from $productname$ next time you perform and Import. This content last built on Wed, 6 Jan 2016.